Active Noise Control (a.k.a. Active Noise Cancellation), ANC, has been one of the trends in Applied Acoustics for several decades. Often the topic of Active Noise Control is jointly treated with Active Vibration Control, AVC (cf. Ref. ), particularly in applications related to vehicular technology and aircraft structure technology, with the objectives related to improving passenger comfort and crew working conditions. Figure 1: (a) Outline of the ANC method in ducts (or similar spaces where the noise cancellation space target is a specific point in the acoustic field of very limited 3D space; (b) an example of ANC block diagram (a feed-forward version). Static S(z) models S(z). W(z) is an adaptive filter transfer function estimating the transfer function between the output of microphone M1 and the input to the SPKR. There are here no specific provisions regarding the adaptation algorithm type because the ANC outline is intended to be kept general. The original idea of Active Noise Cancellation is, in general terms, straightforward. It employs the superposition principle to the linear systems and takes advantage of the feedback control principles. By making use of the notion of destructive interference, it applies an “anti-noise” wave (i.e., the signal of the opposite phase or polarity) to the target point of 3D space (or to the target small contiguous sub-space of the 3D space), by using a secondary noise source fed by the “anti-noise” signal and using a sensor (or an array of sensors) capturing the destructive anti-noise effect. Through the feedback loop and adaptive controlling mechanism the whole system reduces the unwanted signal at the target point or in the target space. Physics-based principles for active noise cancellation come from Kirchoff’s Integral Theorem (also referred to as Fresnel-Kirchhoff integral theorem), cf. Ref. . The theorem states that the entire effect of wave sources inside a closed 3D boundary can be duplicated by sources distributed on this boundary. Consequently, if “opposite phase” sources are introduced and distributed on this boundary, then the primary acoustic field in the interior of the boundary can be completely cancelled. A perfect practical utilization of this theorem is very challenging: in order to implement a noise cancellation system based on this theorem, a mesh of sensors is required as well as an adequate number properly distributed secondary sources (loudspeakers), adequately controlled by processed signals from the sensors, need to be employed. One of the early successful projects involving the ANC resulted in an US patent (1936; cf. Ref. ) and since then a multitude of approaches to Active Noise Cancellation have been pursued. In general, Active Noise Control has been proven as very efficient in applications such as controlling the noise level in very small spaces and enclosures (cf. applications such as active noise cancelling headphones). Applications of Active Noise Control to limited target space (such as around the human’s head in semi-static location, for example in environment such as a vehicle’s cabin, noisy workshop, noisy office) have been successful although the efficiency of the noise control in such applications has been uneven, and generally speaking, better for lower frequencies than for higher frequencies, due the physics of wave propagation and wave effects manifesting differently for different wavelengths and due to the boundary conditions affecting the distribution of the acoustic pressure in the 3D spaces. In other words, “pointwise active noise cancellation systems” as motioned above, have been proven as functioning adequately, and, in many implementations, have become broadly acceptable solutions with high degree of success. Results of numerical simulations involving predictions of attenuation of noise in larger yet finite numbers of spatial points can result in amplification of the noise in other points. Thus, one of the trends on the ANC for 3D spaces is to optimize the distribution of sensors and acoustic drivers (i.e., loudspeakers) such that in the subspaces where there is either inadequate noise reduction effect or where there is a very local amplification effect of the noise be minimized. 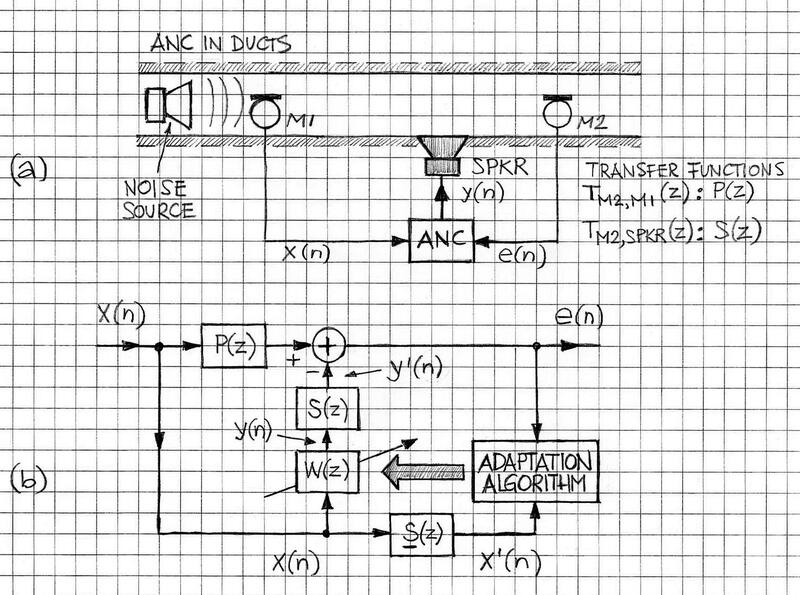 Principal approach to “pointwise active noise cancellation” is depicted in Figure 1 (a feed-forward version of ANC), Ref.. Microphone M1 is located in close vicinity of the noise source. Loudspeaker SPKR generates “anti-noise”, as per microphone inputs and rules of the adaptive algorithm. The figure also provides a general block diagram for an ANC feed-forward version where static S(z) models S(z). W(z) is an adaptive filter transfer function estimating the transfer function between the output of microphone M1 and the input to the SPKR. The list of common implementations of the ANC includes realizations that have already been commercially successful (such as Noise Cancellation Headsets, Noise Reduction in Ducts, Noise Reduction in Engines to mention a few) and other implementations that are under continuous improvement and refinement (ANC in vehicles, Turboprop Aircraft Cabins, Active Mufflers or Silences and many others, e.g. Ref.). The ANC for large spaces continues to be under early development although there are reports about successful implementations (cf. Ref. [6, 7]). VOCAL’s Speech Enhancement solutions include Acoustic Noise Cancellation solutions. These solutions can be ported to the Active Noise Cancellation systems based on single and multi-channel structure portable to any typical digital signal processor or general-purpose processor. Contact us to discuss your noise application requirements with our engineering staff. Optimal Feedback Control Formulation of the Active Noise Cancellation Problem: Pointwise and Distributed, Zangi, K., C., MIT Technical Report No. 583, 1994. Leug, P.(1936), Process of Silencing Sound Oscillations. U.S. Patent No. 2,043,416. The simulation and implementation of an active Noice Control System in a Laboratory Duct. Dadeghi, S. et el, Univ.Teh. 2002.